Established in 1993, The Brearley Singers is a premier, inclusive and welcoming non-audition choral group under the innovative leadership of Music Director Keith Burton. 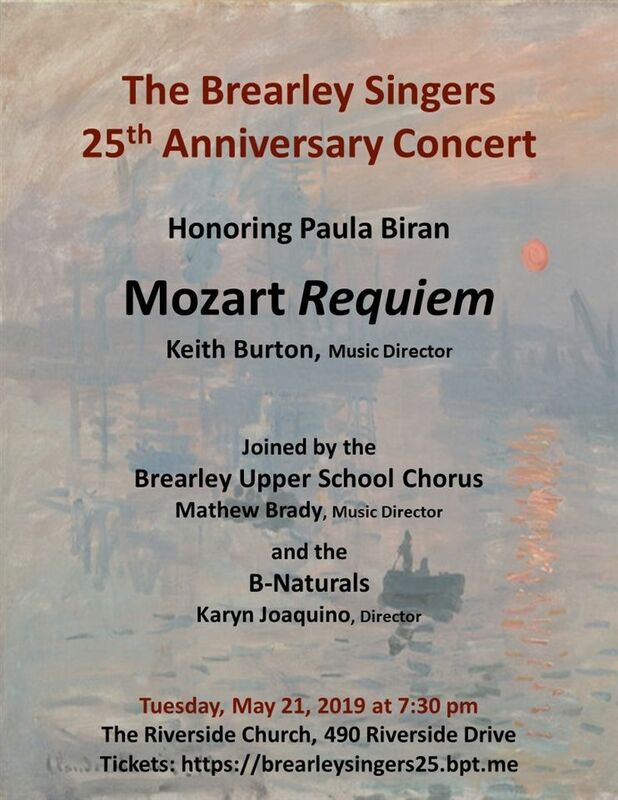 Its approximately 85 members – comprising past and present Brearley parents, alumnae, staff members and friends – present a varied program of classical and modern works in two concerts a year. No musical experience is required to join – only a willingness to learn, practice and participate in this all-volunteer group. If you have never sung in a group before, or think you don't sing well enough to join one, you will find The Brearley Singers to be a wonderfully supportive environment where you can experience the joy of singing exceptional music. We are thrilled to announce our 25th Anniversary Gala Concert which will be May 21st at the Riverside Church and we will be performing Mozart's Requiem with a full orchestra! If you are a former Brearley Singer, or a Brearley parent (current or former) we would especially love it if you sing with us. This sure to be spectacular concert will be in honor of Paula Biran, our original Music Director. For more information or to join, contact br-sing-mem@earthlink.net.